JEAN HARRIS: Andrei, your experience with archives begins with the creation of yourself as a writer, and it includes the creation of four decades-worth of papers and e-writings (post-papers). We’re talking about a writing life that spans continents (Europe—with Romanian and Italian phases—and North America) and political periods (communist and post-communist Romania, Cold War and post-Cold War America). This literary experience is immersed to the hilt in key cultural moments, including late Stalinist, snitch-plagued, communist Romania where you read proscribed poets and wrote rebellious poetry and zeitgeist-heavy scenes in New York and San Francisco in the late sixties and after. You began to write in the Guttenberg age, and you have gone on writing and archiving well into the Cloud era. That’s a lot to organize. 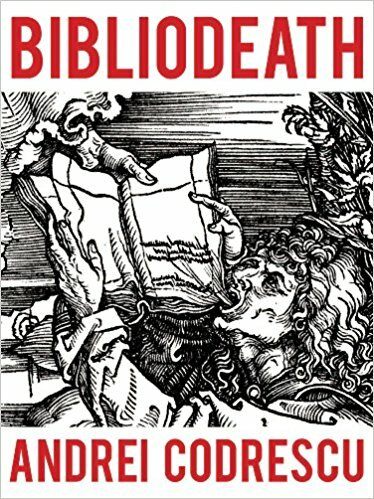 How did you settle onBibliodeath’s format: My Archives: With Life in Footnotes? Did the book evolve out of the forgetting and consequent memory searches and surges, which you describe in “A Rough Guide to the Art of Forgetting,” or is there more to the story? ANDREI CODRESCU: Thank you for the succinct presentation. I couldn’t have done it. Retrospective to me is like looking down into a well with sides of broken mirrors. I can’t remember the Romanian artist’s name, I saw his piece “The Well” at an exhibit in Prague; the inside was mirror shards and the outside was made from the stiff covers of the “classics of communism.” Anyway, the structure suggested itself from a form I discovered in The Posthuman Dada Guide: Tzara and Lenin Play Chess and whatever gets you through the night: a story of sheherezade and the arabian entertainments. This form is an attempt to capture thoughts that occur during writing other thoughts: the subconscious sends up thoughts – or objections—right in the middle of your most coherent (or even your most inspired) typing; I decided to let these thoughts surface, interrupt, and play out, or even take over. I decided they were true, even if mischievous or inopportune, a kind of justifiable sabotage. To make sense of them I put them in footnotes, where they started to write their own book, a “sub-book,” which turned out – surprise, surprise! – to be a memoir. I’m not claiming to have invented this use of the footnote; Nabokov and David Foster Wallace used it in brilliant but different ways. Nabokov had huge fun in Pale Fire, glossing a mediocre poem with a brilliant novel. David Foster Wallace used footnotes to diagnose his characters and his own states of mind. The difference is that you can say “Nabokov” and know in one word what I’m talking about, but you have to say “David Foster Wallace” to get an idea. You can call me anything you want. I think that there is a structural flaw in the “essay” as a form: it is produced at the expense of the life that created it. Michel de Montaigne never shied away from the link between the particulars of his life and the generalizations of the form, but after him the essay separated from life like poetry from music. The hybrid form called “literary nonfiction,” now taught in “creative writing” schools, is a self-conscious effort to reacquaint life and thought, a bit like rap putting the words back to music. Because Mr. Ford ate the last working horse, thus making room for the racing horse. Technologically, the horse is a skeuomorph, but symbolically its power is increased tenfold by its selectively bred descendent. What we call "book" now will also likely be a magical thing that was once common. The symbolic book of the future will be a deluxe object related only slightly to its current Random House ancestor. Current print technology is dying as a mass-tool and will be reborn as art. Art is the last stage of capitalism. Alan Strain: What do you think is the least important thing we could talk about? Andrei: Writing. It's everywhere, our world is very text based. It is used to describe every aspect of our lives, even our DNA is text-based. We live in a sea of text. So it's both too complicated and too plain to discuss. – Ce-a vrut să spună criticul când a afirmat că în poezia dumneavoastră există un univers pluristratificat? – O, asta este în carte... Universul pluristratificat al poeziei mele există ca un default mode. Dacă e acolo, nici nu sunt conștient de el. În timp, am adăugat lucruri poeziei, am lucrat poezia. E stratificată de la început, fiindcă întâi am vorbit germana, apoi maghiara și româna – în același timp cu vecinii și cu mama. Când m-am dus la școală, mi-au spus că nu sunt aceeași limbă. Eu credeam că vorbești așa cu prietenii, vorbești așa cu mama, cu celălalt, am crezut că era un singur fel de a vorbi. Dar cei de la școală mi-au spus că sunt limbi diferite. Atunci am început învățătura asta de sus în jos – mi s-a spus că sunt limbi diferite și am început să le învăț invers, cu gramatică și cu tot felul de chestii din astea care mi-au înghețat mintea pentru 10 ani.